Forgot to share this earlier. Took the family to Athens last weekend for the NCAA Men's match against FSU. Pasha and Co. make quick work of Jameis' former team the Seminoles. 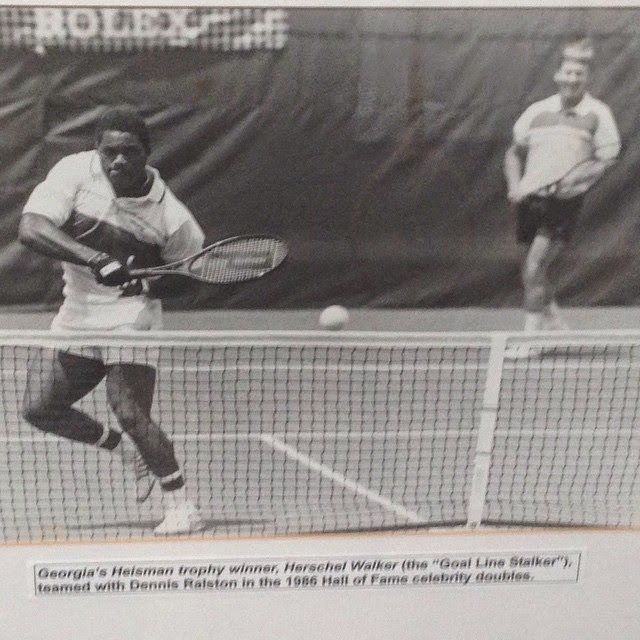 Before taking the stands, we walked through the ITA Hall of Fame, aka the house that Magill built. It was quite the experience. Here's just one of the gems you can find there. That's football's greatest player, executing a perfect net volley which assuredly blazed right past someone like Cris Collingsorth or maybe Bo Jackson before they just dropped their cute little wooden rackets and walked off the court. Visiting the ITA HoF isn't quite the same now that it's legendary curator and Athens' finest Dawg has left this Earth. But it's a trip worth making, for sure.